It's Veterans Day, and if I'm a veteran of anything, it's a scientific meeting. Nearly every time I ran communications for a scientific meeting in my career, some scientist--usually a board member who signed off on my salary and also was distinguished in the field--would ask me "Why do we let all these reporters get in for free?" Because I knew to expect the question, it usually was posed while I took a board member or president on a tour of the meeting newsroom operation, so he or she could see the value and understand up close what we were doing. On one such tour, when I was directing communications for the American Association for the Advancement of Science (AAAS), I was explaining that amongst our close to 1,000 newsroom registrants were two Associated Press reporters who'd be filing two stories a day that would appear in local papers and other outlets around the world. The board president-elect--who's since become a Nobel laureate--thought that was swell. Then he said, "Who the heck are all these other people and why do we let them in for free?" Good job, Graveline. You justified two press registrations, with another 998 to go. Fortunately, I was able to turn and point to each of the nearest 20 or so and reel off some great outlets: "There's NPR. Popular Science. The Wall Street Journal. The Washington Post. Some of them are communicators, here to help connect their researchers--our members--with reporters and the public. That one's from your university, as you know. Which one don't you want exposed to our meeting?" He later turned out to be one of the biggest fans of that meeting newsroom. I knew I had the group's mission on my side. Most scientific professional societies have the goal of public education or awareness of their mission and research--it's in part why they can have tax-exempt status as "educational" and "charitable" organizations under the U.S. tax code. Letting in reporters is an easy way to share results with a wider public, and meet that charitable goal. ...offered no coverage of the event, which is from my experience is what press passes are all about. When I asked if he would do that, he declined. So I don’t think that is a mutually beneficial relationship based on integrity and good faith, and I’m happy to discuss that with you further. I had never, in 20 years of working nonprofit and academia, come across such a proposition, for him to enjoy two and a half days of a really awesome conference on our tab and offer nothing in return. I'll say, in fellow feeling with the Cetacean Society, that I've heard and seen up close all the other issues this executive director raised, plus a few more. It does cost money--a lot of money--to host reporters, even if you don't put together a newsroom operation. There's staff time and lost revenue from registrations at a minimum, and those need to be justified. I've run newsrooms where the coffee service alone approximated someone's salary, and it's not like we served it all day. And reporters always ask for some above-and-beyond help. It's how they roll. I've also run newsroom operations where all sorts of people--fine paying members of the society trying for the free option, spouses of same, homeless people hoping for food, students, marketers, publishers, exhibitors wanting to buttonhole reporters and more--tried to get that free press pass. (A low point was when a Russian arrived in our newsroom in San Francisco with a photocopy of a 30-year-old and now defunct press pass and a chunk of cement he said was a piece of the Berlin Wall, offering them as his credentials. I am not making this up. He did not gain entry.) I've had to turn down plenty of people for press passes in my day. But gaining entry didn't hinge on a quid pro quo in my experience, and -- unlike this organization -- I have never found that to be the norm in more than 20 years of working at and attending dozens of scientific meetings. You certainly hope for coverage. You aid and abet it as far as your budget and staffing will allow, from offering technology to tracking down researchers and convincing them that, yes, it's worth it to talk to the reporter. You retrieve reporters' lost audio recorders and feed them coffee and danish and keep the pesky marketers away so they can work. But you don't promise coverage, and you sure don't demand it. Media relations--the name we use for how organizations interact with reporters--shouldn't be media strong-arming. 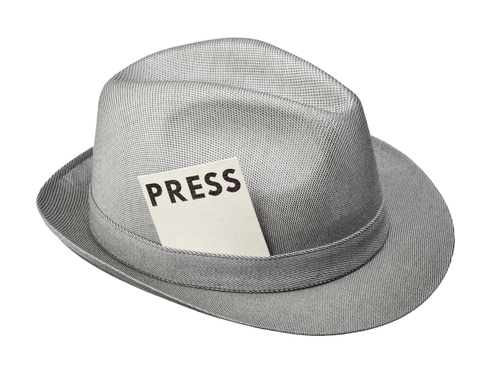 Of late, lots of organizations have struggled with whether to give bloggers press credentials, and I have a handy roundup here of case studies for giving bloggers press credentials from all sorts of organizations that you can use as models. But asking reporters for coverage in return for entry? Even if it were the winning path to wonderful coverage for your meeting, it's not the norm in scientific circles and puts your credibility--the more precious commodity--at risk. I've helped some of the largest scientific societies figure out how to handle press registration at their technical meetings. If I can help your organization do the same, email me at info[at]dontgetcaught[dot]biz. Related post: Do you restrict reporters' recordings at your medical meetings?